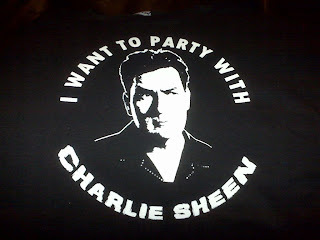 Today, I spent some the best money that I have ever spent on a shirt. To explain I must take you back in time a few days ago. I am having lunch with my good friend Ben Difani. we are talking about the exploits of one Mr. Charlie Sheen and we both agree that we would like to party with him. This is when the idea came to life. Ben's apprentice's family owns a t-shirt company. As you can see for yourself this is the result of the conversation. This is the picture of the day.